Golf is a rather odd sport to make the transition to board games and card games, but it has been converted numerous times, and some of those games are quite good. Here are our picks for the best golf games. For 1 to 4 players, ages 8 and up. 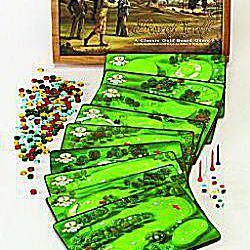 Designed by Robert Labrie and Stephan Barry, published by Box of Golf. Box of Golf is a gorgeous golf game, a wonderful gift for golf fans. The rules are simple but detailed enough that they attempt to simulate many of the situations you'd face in a real game of golf. Gems can be used to help you lower your score -- and you need to win holes to earn the most gems. You don't want to use too many, though, because at the end of the game the player with the most gems wins. For 1 to 4 players, ages 8 and up. Designed by Frederick A. Herschler, published by 3M. Now out of print, this game (published in 1972) features the unusual mechanism of actually drawing on the game board with an erasable marker. After the wind speed and direction are determined, you choose your club and roll the dice to see how you hit the ball. You make a mark on the laminated board and move on from there. For 1 or more players, ages 8 and up. Designed by Patrick Shea, published by Front9. Golo Golf Dice doesn't pretend to be something it's not. It is a simple, addictive dice game that works well with the golf theme and will provide hours of fun without taxing your brain much. We've had a lot of fun with Golo in everything from solo games to a simulated four-day golf tournament with 10 players. For 2 players, ages 8 and up. Designed by Oliver Bolten and Rolf Rötgers, published by Goldseiber. Six different course components can combine to create a full 18-hole course. Players control little metal golfers, using a handle on their back to swing the club and hit the fluffy white ball, hoping to avoid hazards along the way. This is a unique game that's best with one or two players. For 2 to 4 players, ages 8 and up. Designed by Larry Levy, published by Omni Gaming Products. This is a card game that gives players some ability to influence their opponents' shots in addition to their own. A hand balanced with the proper clubs and a few "miscue" cards will help you win.